My first encounter with the Formula 10.0.6 brand came back when I was in my early teenage years. My favourite magazine at the time was Dolly and it was in one of the issues that I came across a sample of their blackhead clearing mud mask. After my first trial of this product I was in love, purchasing the full size shortly afterwards - this was probably one of the first skincare products I bought for myself. 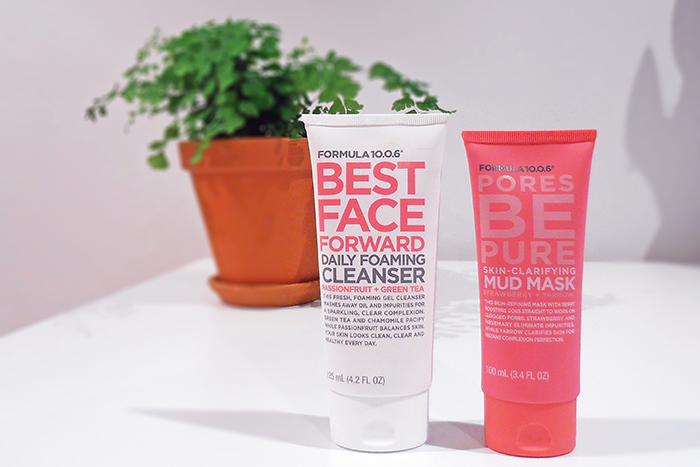 Recently I decided to revisit the brand and picked up the Best Face Forward Daily Foaming Cleanser ($9.99 AUD) and Pores Be Pure Skin Clarifying Mud Mask ($8.99 AUD) duo. Once again, Formula 10.0.6 have not disappointed! The cleanser worked like a dream for me over the summer months, dealing with my oilier skin texture but never being overly drying. using it with my face cleansing brush left my skin feeling fresh and super smooth. Following up with the mud mask really helped to deep clean my skin, getting down into my pores and pulling out any excess oil and impurities. This mask feels tingly and warm when applied - this settles down after a few minutes and is completely normal. After rinsing off the blackheads on my nose are much less noticeable and my skin also feels lovely and soft. While I wont be reaching for the mud mask as often over winter (when my skin tends to be drier) it was perfect for controlling any oiliness I was experiencing over the summer. If you haven't already tried any products by Formula 10.0.6 I would definitely recommend giving them a go! In my experience I have loved how they worked on my skin and they have a range of different products for different skin problems. Formula 10.0.6 is available at Priceline and Big W stores in Australia. If you're international you can click here to find your closest stockist or buy online. Have you tried any products by Formula 10.0.6? What did you think?